As a result of his conviction for fraud, Robert Atcherley Taylor [ ] was sentenced to seven years transportation or, as one commentator gleefully expressed it, “ordered to Botany Bay!” What a shock this must have been for Robert’s family, and what shame they must have felt when the story of his misdeeds hit the press. Robert was after all the son of a clergyman – a clergyman for whom, it seems, Robert’s transportation could not come soon enough. However much his father may have wanted it, Robert’s voyage ‘Down Under’ did not begin immediately after his conviction. The first place to which he was delivered from the Middlesex Session of the Peace was Newgate Prison, a gaol which according to one author “remained constantly, from the first and almost to the last, one of the worst-kept prisons in the kingdom”. According to a House of Commons Select Committee report published in 1813, “When a prisoner is first committed [to Newgate] … he is usually put into the Common side, from whence he is removed into either of the other two [sides], which he may think proper, upon paying the settled fee.” Payment of a fee of two guineas gained the prisoner admission to the State or Superior Master Felons side; an additional seven shillings a week secured the use of a bed (or, if the number of inmates was high, half a bed). For a fee of 13s. 6d. a prisoner could occupy the Master Felons side, where a bed (or half of one) cost 2s. 6d. per week. Having previously been a prisoner for debt, Robert Atcherley Taylor was not in a position to pay for his ‘removal’ from the Common side of Newgate. There, he slept – uncomfortably – on a barrack bed, which was “merely a part of the floor of the room raised in a sloping direction, about six inches above the remainder, with a ledge a few inches higher for the head to rest upon”. Prisoners were issued a single rug to lie on, but were allowed to take in their own bedding if they had any, so long as it was not of straw. Robert remained at Newgate for several months, during which time at least two letters were sent to officials at the Home Office regarding his fate, one by an Archdeacon Corbett, and the second by Robert’s father, the Rev Robert Taylor. When I finally managed to decipher the handwritten replies which were sent (and it appears that it is only the replies which have survived) I was, to say the very least, surprised. The letters from the Archdeacon and the Reverend Taylor were not appeals for clemency. On the contrary, if my reading of the responses to their missives is correct, both men wanted assurances that Robert Atcherley Taylor would be transported! I am directed by Mr Secretary Ryder to acknowledge the receipt of your letter relative to Robert A Taylor a Convict under Sentence of Transportation in the Gaol of Newgate and to acquaint you in reply thereto that Mr. Ryder enters very sensibly into the feelings which you have expressed respecting the Prisoner, and will not fail to direct his removal to the Hulks from Newgate in the coming few days, and furthermore he will be sent to New South Wales by the first opportunity. One interpretation of this correspondence is that Robert’s father, and the Church, took the view that seven years in the Colonies would be good for Robert’s soul: he would have plenty of time to contemplate the error of his ways and repent his sins. A less generous reading of the situation is that Robert Atcherley Taylor was regarded as an embarrassment by both his father and the Church, an embarrassment which was best removed as far away from the public’s attention as possible. Robert’s transfer to the prison hulk Zealand, at Sheerness, took place on 27 February 1812. A Select Committee report dated 27 June 1812 shows that prisoners aboard the Zealand were confined to three decks of the ship. During the hours of darkness the prisoners were locked down within their decks and left to their own devices, with no officers or guards to control them. Over the winter months this period of lockdown could account for as much as two thirds of each day. For Robert, those nights must have been very long indeed. … the number sent on shore from the Zealand necessarily depends upon the demand made from day to day by the officers of the Dock-yard at Sheerness, there not being regular employment at present in that yard for more than about 200 out of about 500, which that Hulk generally contains; but there does not appear to be any precise rule by which the Captain determines which individuals shall go on shore, or settles who shall do the ship’s duty. The convicts all dine on board the Hulk, and those who have worked on shore before dinner are replaced afterwards by those who remained on board during the former part of the day, unless more are wanted than can be supplied from the latter description, in which case some of those who have been employed at the easiest work on shore are sent again to make up the number required. The Zealand’s Quarterly Book shows that Robert received 23 days of victuals (covering the period from 27 February to 31 March) and was provided with the following items of “cloathing”: one jacket, one waistcoat, one pair of breeches, one pair of stockings, two shirts, one handkerchief, one pair of shoes and one hat. Another 21 days of victuals were allocated from 1 April, along with an additional pair of breeches and also of stockings. After 21 April, it is likely that Robert was on the move – and heading for his next ship. Robert Taylor, convicted on 23 September 1811 at Middlesex Sessions of the Peace, appeared in an “Account of Convicts delivered on board the Indefatigable”, “on or about the 9 Day of May 1812”. This was the vessel which would take him on the long voyage to the colony of New South Wales. These two vessels arrived at Rio Janeiro the 29th of July, and found there the Archduke Charles, from Ireland, with 150 male, and 50 female prisoners for Port Jackson. The three vessels sailed in company from Rio the 11th of August last, but the Archduke Charles separated the day following, and may shortly be expected. The Minstrel and Indefatigable kept company till the 7th of August, and then separated in a gale of wind. While the Minstrel was bound for Port Jackson (now Sydney Harbour), the Indefatigable was headed for Hobart Town. She reached that destination on 19 October, having lost just one of her cargo of convicts en route (who was “killed by the accidental explosion of a musket”). Robert Atcherley Taylor had finally arrived in Van Diemen’s Land. Back in England, his father was perhaps praying that a few years spent on the other side of the world would change Robert for the better, and return him to the path of righteousness. If so, his prayers were to go unanswered. > On to Part 3. Picture credits. 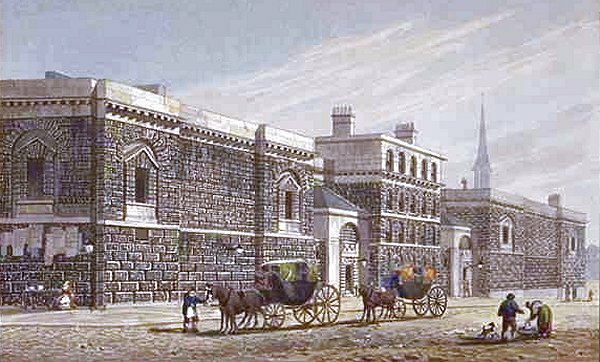 West view of Newgate (about 1810): Enhanced version of public domain image at Wikimedia Commons (19th century print of a painting by George Shepherd). 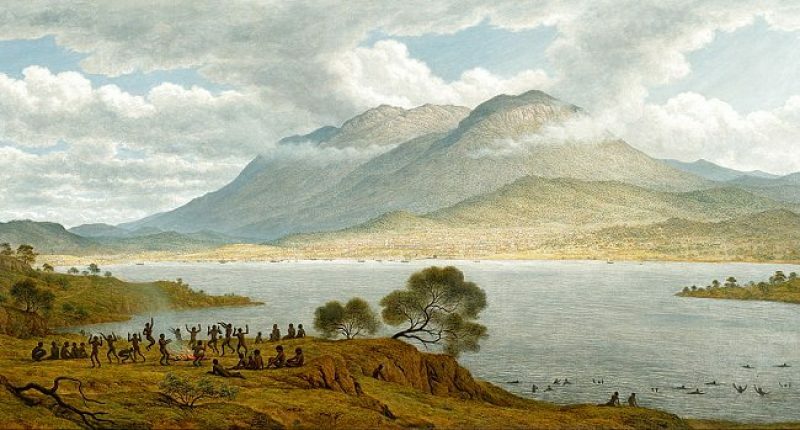 Mount Wellington and Hobart Town from Kangaroo Point: Adapted from a public domain image at Wikimedia Commons (1834 painting by John Glover). Criminal Registers, England and Wales (The National Archives, Kew, Class HO 26, Piece 17, page 98). Copy viewed at Ancestry – England & Wales, Criminal Registers, 1791-1892. Church and State, Swindling and Botany Bay! In: The Reformists’ Register, no. 3, 12 Oct 1811, pages 45-6. Copy viewed at Google Books. Newgate Prison, London: lists of felons on the Common Side (Series PCOM 2, piece 187. Several entries for Robert Atcherley Taylor. Copies of selected pages viewed at Findmypast – England & Wales, Crime, Prisons & Punishment, 1770-1935. Arthur Griffiths (1884), The Chronicles of Newgate, volume I, page vii. Copy viewed at the Internet Archive. Report from the Select Committee on Mr. Thomas Croggon’s imprisonment at Newgate. In: Reports from Committees (Fist Part), volume III (Session 1812-13). Copy viewed at Google Books. Home Office, Criminal Entry Books 1782-1871 (The National Archives, Kew, Series HO 13, piece 22, pages 244 and 306). Copies viewed at Findmypast – England & Wales, Crime, Prisons & Punishment, 1770-1935. Treasury, Departmental Accounts, Convict Hulks: Zealand’s Quarterly Book to 31st March 1812 entry 505 (The National Archives, Kew, Series T 38, Piece 337). Copy viewed at Findmypast – England & Wales, Crime, Prisons & Punishment, 1770-1935. Third Report from the Committee on the Laws relating to Penitentiary Houses. In: Reports from Committees &c. (Second Part), volume IV (Session 1813-14). Copy viewed at Google Books. Home Office, Convict transportation registers (The National Archives, Kew, Series HO 11, Piece 2, folio 30, page 57). Copy viewed at Ancestry – Australian Convict Transportation Registers – Other Fleets & Ships, 1791-1868. Indexed at One Search Family History Indexes. The Sydney Gazette and New South Wales Advertiser, 24 Oct 1812, page 3. Copy viewed at Trove. The Sydney Gazette and New South Wales Advertiser, 12 Dec 1812, 2. Copy viewed at Trove.